Yvon Lambert is celebrating his gallery’s fortieth anniversary (and his twentieth in his current space) with an exhibition that combines historic and new works from the gallery’s artists with “personal messages” conceived for the occasion. Each artist is represented by one work, and from this assembly of drawings, photographs, collages, sculptures, and text pieces emerges a trace of the gallery’s identity. Several generations rub elbows, from elder statesmen Carl Andre, Niele Toroni, and Lawrence Weiner to younger artists, including Claude Lévêque, Jonathan Monk, Koo Jeong-a, and Mircea Cantor. Walking around the show, several unifying themes begin to assert themselves—most notably, a genuine affection for words. Jonathan Monk’s neon work flashes: “PAY ATTENTION / MOTHER FUCKER,” humorously referencing experiments with artwork as direct message. In another room, a piece by Lawrence Weiner demonstrates an attention to more formal issues (signed and sealed and delivered, 2006). Portraiture returns in a variety of ways, a necessary gesture, perhaps, when celebration is the modus operandi. 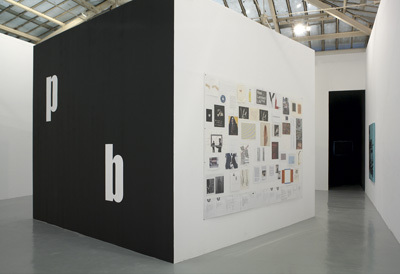 This genre is present in a series of thirteen photographs by Douglas Gordon (What am I doing wrong, 2005), Stanley Brown’s portrait of the gallerist, another by Cy Twombly, Claude Lévêque’s installation Richard, 2006, and, in a corner, Koo Jeong-a’s detached photograph of a dog, UPY, 2006. On the walls of a cube-within-a-cube in the middle of the main room are assorted “messages” written by the artists, testaments to the value of the exchanges that Lambert has facilitated over the last four decades.